Hi Friends! 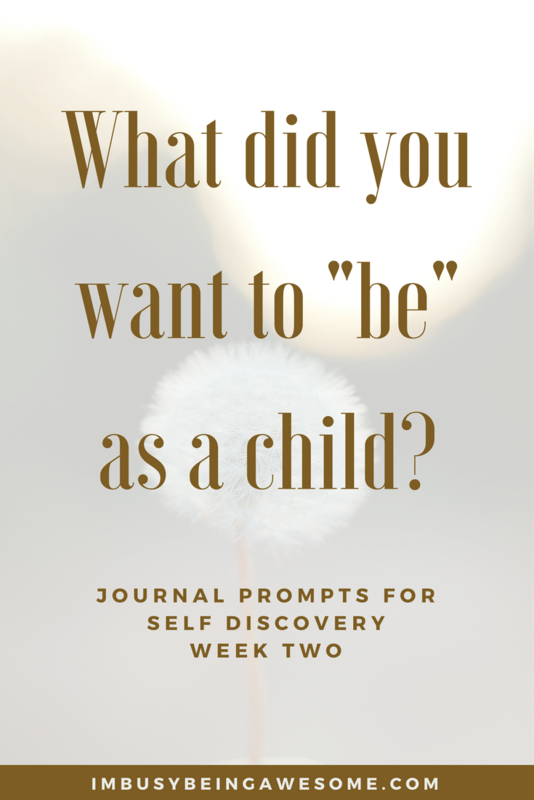 Are you ready for week two of our journal prompt challenge? Great! Let’s do this. This might take a bit of mental digging. Chances are you wanted to “be” many different things when you were young. That being said, I’m willing to bet there is one dream that stands out clearly in your mind. Or, perhaps there’s a handful of related ideas that all circle around one theme. Rediscover your passion through your childhood dreams. Although it’s a simple question, it’s one that I hope you’ll consider today. You see, in order to better understand your past, and how that past connects to who you are today, you need to remember what inspired you so many years ago. If we can identify who we were as children… If we can remember what we loved and what excited us before the “I should’s” and the “I’m supposed to’s” became a regular part of our vocabulary, we can better understand what makes us tick. Because as crazy as it sounds, I’m willing to bet that there was a time when you believed that you could be anything you dreamed of, and those outer expectations held no influence. Nope, if you wanted to be an astronaut, a professional tennis player, a veterinarian, or the first female president, there was no one there to tell you no. It was a time when anything possible. Now, I’ll be the first to admit that I had a difficult time recalling these dreams at first. In fact, it wasn’t until I came across an old grade-school assignment that I had a sudden burst of recollection. Those of you who know me won’t be surprised to discover that my story was 36 pages long (the requirement was 4-6). You see, writing this book wasn’t “homework“ to me. It wasn’t a burden or hassle. Rather, it was something that I loved. I lost myself in the writing, I drew picture after picture, and I enjoyed every minute of the process. You see, at the back of my book there was a “Meet the Author” section. We had to write a little bit about ourselves, and then talk about what we wanted to be when we grew up. When I read this answer the other day, it really struck a chord for me. Because when I am at my happiest, and when the time flies by without me glancing at the clock, I am either writing my blog or dreaming up new creations for my Etsy page. 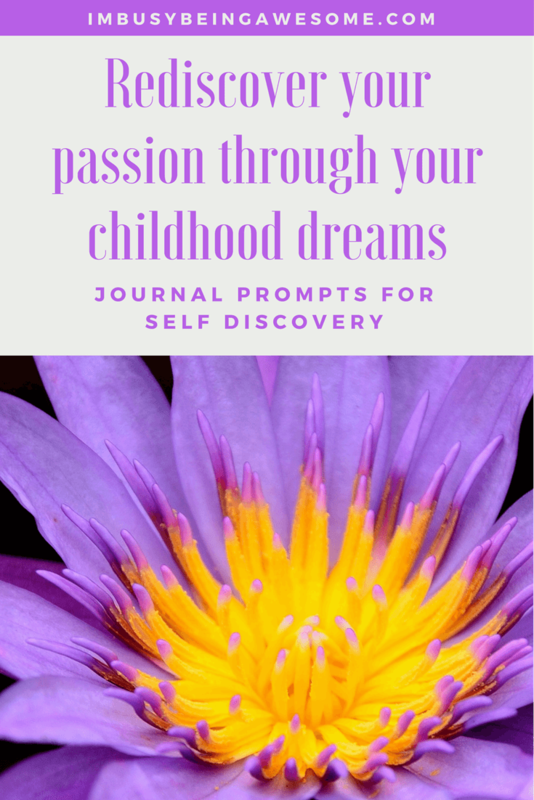 And when I took some time to reflect on the aspirations of nine-year-old Paula, I realized those dreams of becoming an author and an artist are just slightly different versions of the blogging and creating I love today. By considering these simple questions, you might just discover a new passion or re-ignite an old one. Need a reminder to reflect on this prompt for the week? I have you covered. Click below for three freebies! You’ll find a printable to hang in your office or on the refrigerator, a desktop wallpaper for your computer, and an image for your smart phone’s lock screen. Download them here and get started today! 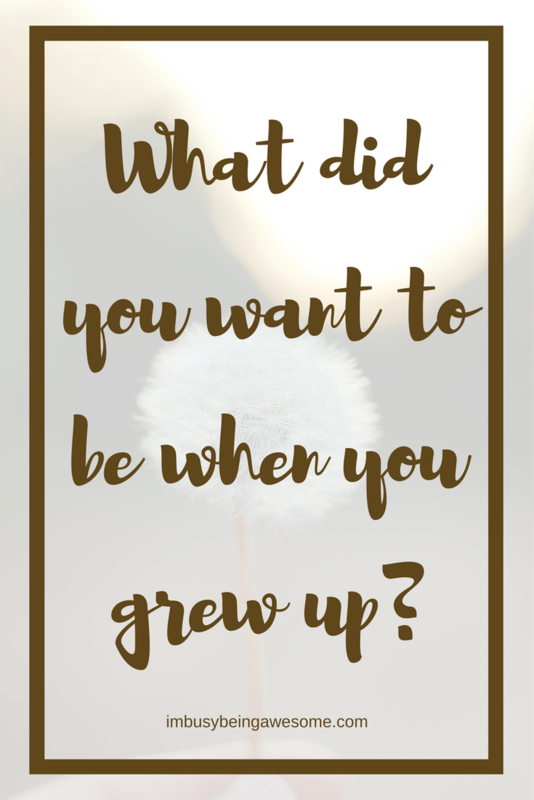 Tell me – what did you want to be when you were little? Do you see any connections to your life today? Let me know below! It sounds like you have some wonderful areas to begin! It looks like you’re blogging, right? Perhaps you could try sharing some short stories on there. Maybe by writing several short stories, you would find a thread that connects them together into one larger theme. And it’s never too late to learn how to sing! Do you have a local college or university near by? Check out their music department; I bet there are some students who would be willing to give voice lessons. It’d be a fun thing to try! Unfortunately not anymore! But yeah, I am sure there would be some teachers around in town honestly. Yes, it’s always a little scary to share our art/stories with others. I hope you can soon, though. It sounds like it’s important to you! I lovelovelove this! Looking back on what excited and motivated is as children is a great way to reflect on where we are now. I just love this idea! I think reflecting back on your childhood dreams can really help remind you about what you are passionate about. I always loved writing and wanted to be a writer, but did not get back into it until having a child of my own, when I started to consider what her dreams may be. Awesome post! I, too, wanted to be either an author or an artist, and I’m so happy that these days I’m working on doing both! oh i love this!! whenever i am struggling I always try to figure out what my child self would do or say! It always provides so much clarity! Yes! I totally agree. It’s so important to stop and reflect. For me it was “an artist.” It’s taken a while to get back to creating but I’m so glad that I’m here. Writing is a bit different than coloring a masterpiece, but it is still all about creating something new and putting it out there into the world. Thanks for the great read! Ohhhh! I love this idea! I like how you walked us through your process. This is really worth pondering! Thank you! Isn’t it? It’s amazing how those passions and interests manage to stick with us through so much. This is a great prompt! Not just for journaling but for thinking! 🙂 I too wanted to be an artist, and in a way I suppose I am! Writing is art right?! Also, another part of me wanted to be an archeologist… Indiana Jones anyone? I suppose I kind of fulfilled that too! Does collecting children’s rocks and treasures count?!! Thank you getting me to be nostalgic today! It totally counts 😀 And yes, writing is absolutely art. Thanks, Katie! I have always, always, always wanted to be a teacher. And, even though I was derailed several times, I eventually got there. This is a great post! I do agree, it is important to go back and make sure that we are staying true to our young selves, this is a good read thanks for sharing.